The front page of The Watchman says it all. 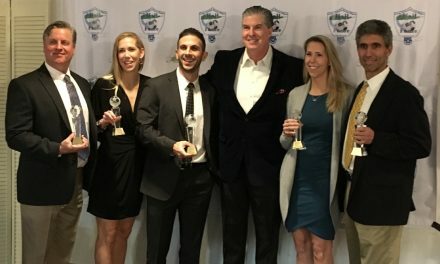 A slight realignment of the Suffolk County boys soccer leagues this year almost interrupted the best and longest running high school sports rivalry on Long Island, if not the state. During the offseason Center Moriches was moved to League VI while Mattituck, which is fighting a declining school district population, remained in League VII. Translated: That meant the two long-time rivals were not scheduled to play one another. There was no way that Mattituck head coach Will Hayes or his Center Moriches counterpart Chris O’Brien would let this derby die on the vine. So, they scheduled a non-league match Monday at CM at 6 p.m. Since both schools are Class B sides, they still could meet in the county playoffs – Moriches won last year’s final, 6-0 – but the coaches did not want to take a chance. The Tuckers-Red Devils rivalry goes back to 1937, when Mattituck defeated Center Moriches for the county championship, 1-0. They have clashed for some classic, titanic battles through the decades. “I was disappointed to see that we weren’t in the same league,” he added. “It’s part of history. Sort of not having the Yankees and the Red Sox no longer in the same league. There are few other high school soccer rivalries on Long Island that match the intensity these two teams put on the field. No other soccer rivalry goes back 81 years and it still resonates today. 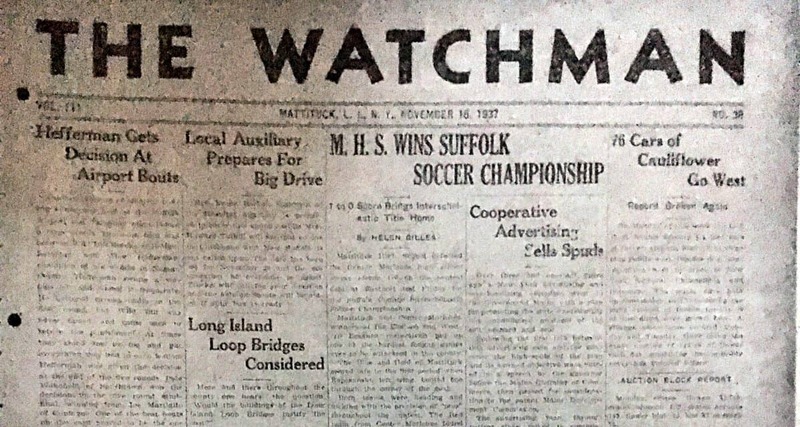 In fact, on Nov. 12, 1937, Mattituck defeated Center Moriches, 1-0, at Eastport High School to capture the Suffolk County Interscholastic soccer title. 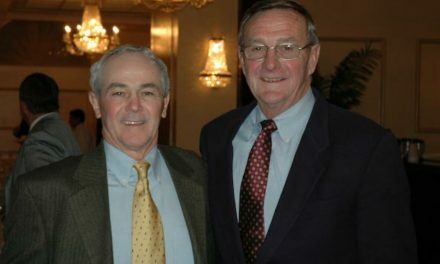 It was the first year the Tuckers fielded a competitive team, directed by the legendary coach Robert Muir, for whom the school’s athletic fields are named. How big was the accomplishment on the East End? It was the top story in the Nov. 18, 1937 edition of The Watchman. How appropriate that it was hotly contested because many Center Moriches-Mattituck confrontations seem to be that way in the modern era. “They always play us hard,” Mattituck senior goalkeeper Steve Ostrowski said in 2013. “You know it’s going to be a one-goal game. You know it’s not going to be a soccer game. Regardless of where the schools are ranked, there will always be a rivalry. “I don’t care if Mattituck or Center Moriches is a fourth- or fifth-place team or the first- or second-place team,” O’Brien said five years ago. “It’s always a big game because it’s a rivalry game. We haven’t beaten them in the county playoffs in three years. The last time we did was ’09 and we wound up winning the whole thing. We won the state championship that year. It would be nice to get back there with this group. In the 2012 Suffolk County Class B final, for example, Mattituck, despite playing a man down and after right back Walter Jacob was red-carded, overcame its rivals, 4-2. Apparently there was some juice in that first championship game. Mattituck left wing Lucien Repczynski scored the lone goal into the center of the net late in the 12-minute first quarter. According to the Traveler, Center Moriches had difficulties penetrating the goal area due to defenders named Danowski and Bialeski (no first names were given in the story). Goalkeeper Eddie Jazombek made only one save. “A large crowd and bands from both schools gave the necessary color to the playoff contest,” the Traveler reported. So whatever passion there was then has been brought forward some 81 years. Not surprisingly, two of the best Class B teams will tussle Monday night as No. 2 Center Moriches will meet 20th-ranked Mattituck (rankings by the New York State Sportswriters Association).